CANADIAN PREMIERE – A visual, auditory, and emotional journey through the beauty and complication of our deepest fears, ambitions, and confessions. 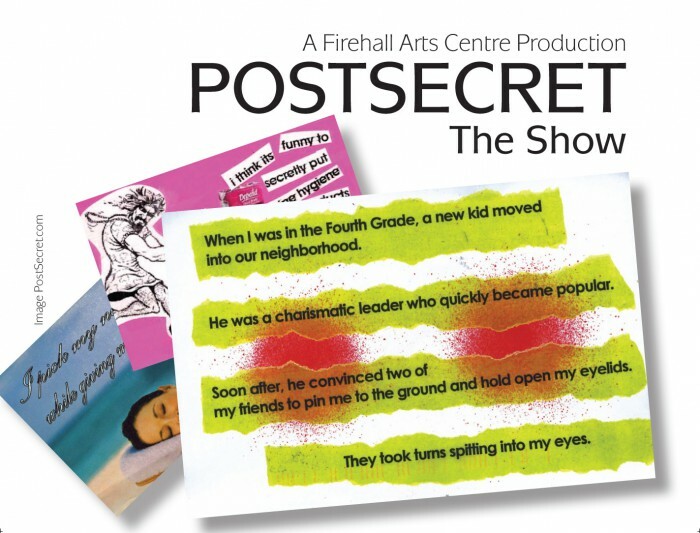 With original music, recorded voices, projected images, and video, PostSecret: The Show becomes an immersive experience as three actors guide the audience through a crowd-sourced narrative of the stories behind some of the most sexual, sad, funny and controversial – many of which have never been seen before. With half a billion visitors, a million anonymous secrets received and 6 bestselling books, artist, curator, and internet phenomenon Frank Warren has teamed up with Vancouver’s TJ Dawe, Kahlil Ashanti, and Justin Sudds to bring life to the unheard voices of PostSecret, one of the most popular blogs in the world. PostSecret: The Show is a breakthrough in audience-sourced storytelling that reminds audiences that no matter what you may be facing, you are not alone. Created by Frank Warren, TJ Dawe, Kahlil Ashanti, & Justin Sudds. Starring Kahlil Ashanti, Ming Hudson & Nicolle Nattrass. Music by Mario Vaira. A Firehall Arts Centre Production. Click here to check out the secrets shared by audience members at the Vancouver show so far. @DistrictLocal Funny, uplifting, and sometimes devastatingly heartbreaking. @kaitlinwills My not-so-secret secret: I cried off all my makeup tonight at #psvancouver. Go see this play! @fionamcglynn Humans are Awesome! Nothing held back at #PSVancouver last night. Show is a must see! @ihatebillpats Highly recommend Post Secret: The Show. Powerful stuff. View messages from audience members who’ve experienced PostSecre: The Show on our blog. Missed PostSecret creator Frank Warren’s talkback earlier this week? Our awesome radio partners CiTR FM podcasted it. Listen to it here.